On Monday my wife Judy will be having major surgery. The surgery, and the reason for it, were pretty big surprises. We learned of the need for it just a few weeks ago after Judy went in for what was expected to be a routine examination. It's a scary time for her, and I must confess to being a bit of a wreck, too. Since getting the news I've kept up my daily Stripper's Guide blog posts. It's a good way to get my mind off this whole situation for a little while every day. But now I have to focus on it 100%, and Stripper's Guide posts are going to have to take a short hiatus. Judy and I fully expect that the surgery will be a success and her recovery will be quick and complete, and that means I'll be back here very soon, nattering on once more about obscure comics. If you're like me, you hate checking a blog every day only to find that there's no new post. If you'll look a little ways down on the sidebar, you'll find an icon for blogarithm.com. These folks have a neat service where they notify you via email when a blog (or any website for that matter) posts new content. I highly recommend the service, and if you want to be notified when the new posts are back here on the blog, they can take care of that for you. I use bloglines myself, so I'll be waiting for your return. And you have my prayers and best wishes for a successful outcome. I was new here, but learned to love it quickly. All the best in coming period for you and your wife. I read via RSS, too, and love your blog. Best wishes to you and your wife! Joining in wishing the best for the missus and yourself. won't download for me anymore. Dear Allan, have my warmest wishes for your wife and also for you, as from personal experience I know that one must be strong in these situations. Hope everything will end up in the best of the ways, and we'll all be able to enjoy a fast return of your blog, meaning everything is ok. A kiss to Judy: get well fast! Best of luck and all prayers to the two of you. Forgetting the blog for a moment, keep us informed of how things are going with your wife. Walter Hoban's first known syndicated strip was Jerry MacJunk from the North American Syndicate, publishers of the Philadelphia North American. According to the World Encyclopedia of Comics, Hoban was born and bred in Philadelphia, and started as an office boy at the North American with no particular interest in pursuing a career in cartooning. However, his abilities in this area were noted and he was pressed into service as a sports cartoonist. In 1910, May 1st to be exact, he made the jump to the Sunday funnies with Jerry MacJunk. Hoban was just 20 years old. Jerry was a put-upon everyman, a Born Loser type that has always been a fixture of the comics page. 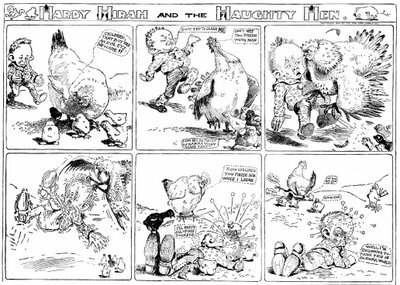 What distinguished this strip was Hoban's energetic drawing style; a style that seemed to spring fully-formed from the young Hoban, and would serve him well over his 30 year newspaper cartooning career. 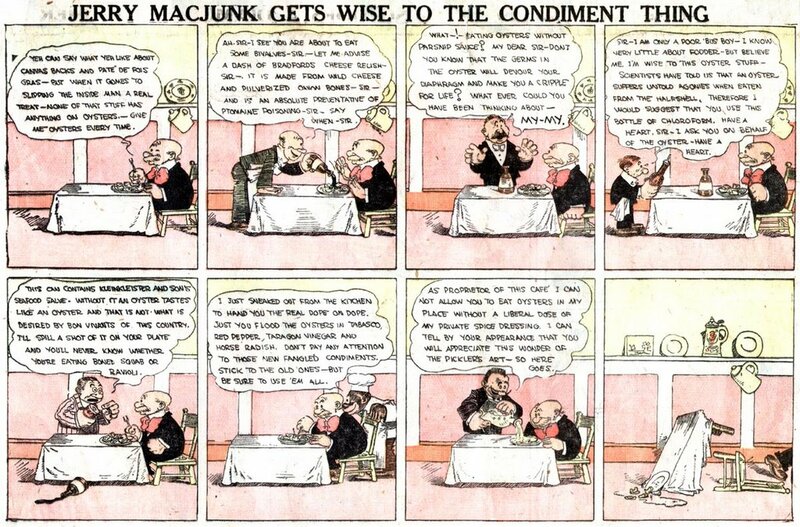 Jerry MacJunk was a successful strip, running every Sunday in the North American and their few syndicated client papers until January 11, 1914. The strip came to a halt when Hoban left Philadelphia for the higher paychecks of the Hearst organization in New York (not 1912 as claimed in Bill Blackbeard's Hoban entry in the World Encyclopedia). There Hoban found much wider success with another Jerry, Jerry On The Job. 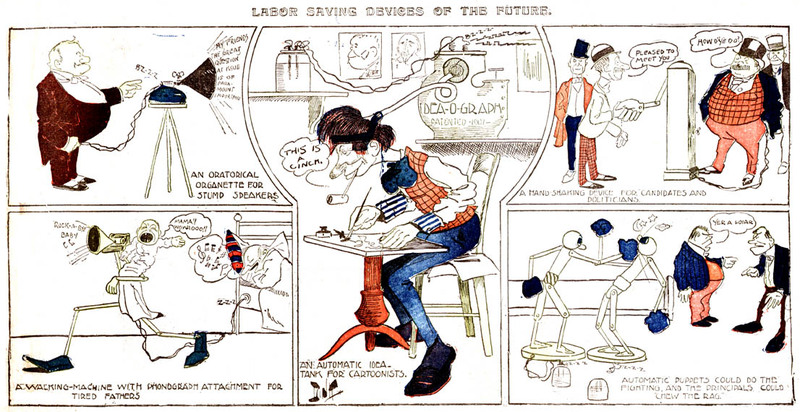 The Jerry MacJunk strip had a second life when World Color Printing obtained the rights to reprint much of the North American's output of the early teens. 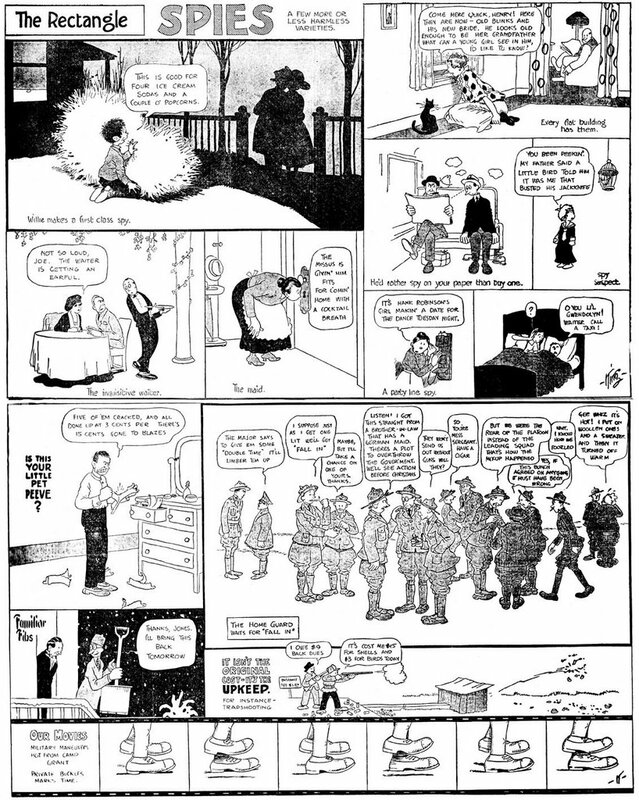 The strip ran in the WCP preprint section from 1915-1918. I was about to file this page away when it occurred to me that I've never seen a complete The Rectangle page reprinted anywhere. Maybe my recollector just isn't working well enough, but in any case I thought surely all you Frank King fans wouldn't mind seeing one even if a few have seen the light of day elsewhere. 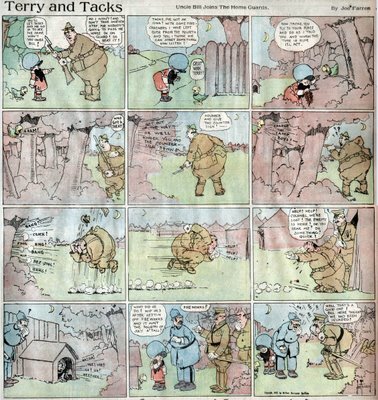 The story is well-known that the denizens of Gasoline Alley were born in the compartmentalized patchwork of the The Rectangle, King's Chicago Tribune Sunday page normally printed in black-and-white outside the comics section. But they were a late addition to a page that had been running for years. King's page first ran under the Rectangle name on 12/27/1914, but had been running for quite awhile before that as an untitled feature. The untitled version was usually run at a smaller size, and I have so far not traced it back to find the ultimate start date. Anyone with access to the Trib online care to take up the chore? The Rectangle was retired on 2/8/1920 after having run sporadically starting in 1919 when King added the daily Gasoline Alley strip to his workload. We've got a boatload of Rectangles up at Barnacle Press, on our Frank King page. I stand corrected, Holmes! So how about that start date, since you've got access to the Trib on Proquest? I think it was Jan 9, 1913 (link below). I pulled King's works thoroughly from that era, and on the previous Sunday, there was just his "Do you mean what you say?" panel. The next week was the full page "Hints to Husbandettes," which was the first with the familiar bounded rectangle containing themed "unpanel" gags. It wasn't until February of '14 that the Rectangle pages appeared with regularity. Of course, the PQ database isn't 100% complete, so some of the holes you see on Barnacle Press' page might well still be represented. Thanks, Holmes!! Good sleuthing, as it were. My question is kind of off-topic, but I have asked it on many sites and message boards without getting an answer. In the upper right hand panel, rather than a door, there are drapes at the entryway. This was the fashion in the early part of the century and you can see it in many strips of the time, such as Little Nemo. When did this stop being the norm and why? I suspect it had something to do with health issues, but that is just my guess. The doorway draperies were a Victorian style. Beyond the aesthetic value, I would guess that they were mostly used to get some privacy from the prying eyes of maids and servants, a common fixture in even homes of moderate means in the day. As hired help slowly faded away as the norm, so presumably did the privacy curtains. Here's a cute Sunday strip from 1902. Hardy Hiram ran from 3/2 to 4/13/1902 in the New York Tribune. At first glance you'd think that the cartoonist failed to sign the strip, but if you look at the chicken on the right in the last panel you'll see that its tailfeathers spell out V E T. So the question is, who is VET? Anyone know? I just found a blogger hack that allows your comments to appear on the main blog page along with my posts. It is now available (as you can see, since this is a comment). As I've said before, the rewards for running a blog are few - for me the best is to get feedback from you folks. So share your thoughts when you read the blog, and now your comments will show up right on this page! There was a "Vet" Anderson that kicked around animation for a number of years. He animated for one or more of the small shops that produced the silent Mutt & Jeff cartoons in the teens under Bud Fisher's name. I believe that he also worked at the Fables Studio for Paul Terry during the 1920's. He was at Max Fleischer's New York studio in the early thirties and then moved to Walter Lantz's studio in California. He seems to have been a bit older than most of the kids in that business. If memory serves, he was called Vet because he served in the Spanish-American War. Some animation histories confuse him with Carl Anderson (of Henry fame) who was an animator for the Bray Studio in 1916 or so. Great thought there! I hadn't thought of Vet Anderson - guess I was stuck on the idea that the letters were initials. Anderson has one known newspaper comic strip credit at the NY World in 1908, so he was interested in doing newspaper work. Unless someone has reason to believe this isn't Vet Anderson, I'm going with that. That is Vet Anderson's signature. (My wife is one of his grandaughters.) He was a political cartoonist at the New York Herald Tribune and the Detroit Free Press. He also sculpted two bas-reliefs in Golden Gate Park - San Francisco near the Horseshoe Pits - a Horseshoe Pitcher and Horse. Jeffrey Lindenblatt called me yesterday to discuss a head-scratcher he'd encountered in his research. He was finding new information on Jack Wilhelm's That Certain Party strip that indicated it ran much longer than previously supposed. That brought up the question of how Wilhelm could have been handling two daily strips at the same time; the aforementioned strip and Frank Merriwell's Schooldays. Well, to make a long story short, we did a little bit of E&P research on the phone, and then I delved into my files, and I've ended up rethinking the history of the Frank Merriwell strip. Or rather, strips, plural. The few comic strip histories that mention Merriwell state that it began in 1931. Well, I know better because I have a run that starts in 1928, and I have a contemporary E&P article that tells me that the strip began on 3/26/1928. Case closed? I thought so. Well, case reopened. I'll spare you the sleuthing involved, and just get to the results - there were two separate strips. The first, titled Young Frank Merriwell, seems to have run 3/26/1928 - 9/28/1928. It was syndicated by McClure and featured art by a very rushed and/or disinterested John Hix. The second run, usually titled Frank Merriwell's Schooldays, started 7/20/1931 and ended 7/14/1934 (to be replaced by Chip Collins Adventures, discussed at length in this blog entry). It was drawn by Jack Wilhelm from start to end and syndicated by Central Press Association. As long as I had all my Merriwell strips out, I scanned in the first five strips of the first series to show you. At least I think they're the first five, but they either ran a week or so late in this paper or there were some introductory strips missing from my run (notice that the numbering starts with #1, though). Fair warning before you start reading - caution - turgid prose ahead! Oh, by the way, the reason for that incredibly moronic subtitle "The Son of His Father", is that the hero is Frank Merriwell Junior, son of the 1890s hero of dime novel infamy. Here it is Memorial Day, so let's find an obscurity with an armed forces angle. Easy to do, too, if you look at wartime comic strips. Many features wholeheartedly embraced war themes in World War I and II, far fewer in later wars. Later wars, of course, did not have the benefit of having public opinion so solidly in their favor, so few cartoonists felt it in their best interest to dwell on them. Here we have Terry And Tacks, which takes an unusual spin on the perenially popular 'a boy and his dog' theme. Young master Terry's constant companion is a parrot, a pet with the distinct advantage of being able to talk. This becomes the springboard for most of the gags in the strip, as Terry employs his feathered friend to pull off all sorts of Katzenjammer-style stunts, aided by the prodigious vocal capabilities of Tacks. Terry And Tacks ran from 2/13/1916 to 7/7/1918 in the McClure Syndicate's preprint Sunday comic section. 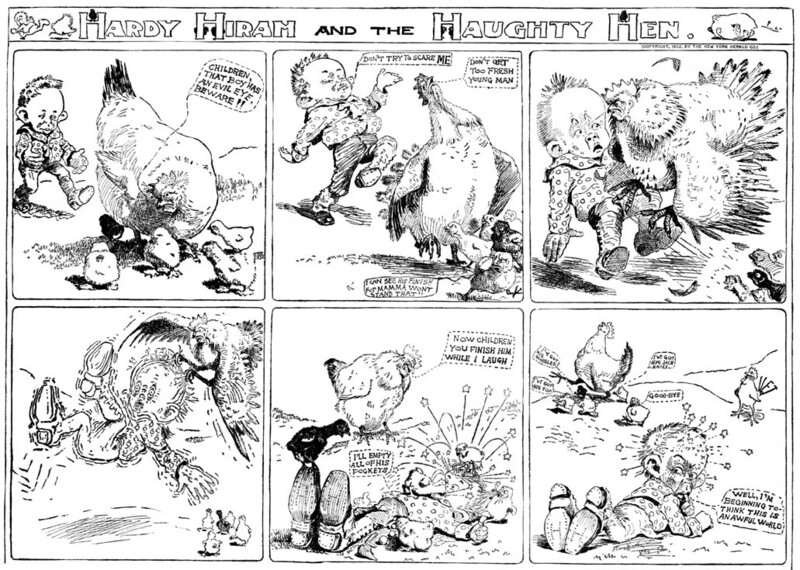 The strip was by Joe Farren, a journeyman cartoonist with a distinct lively style. 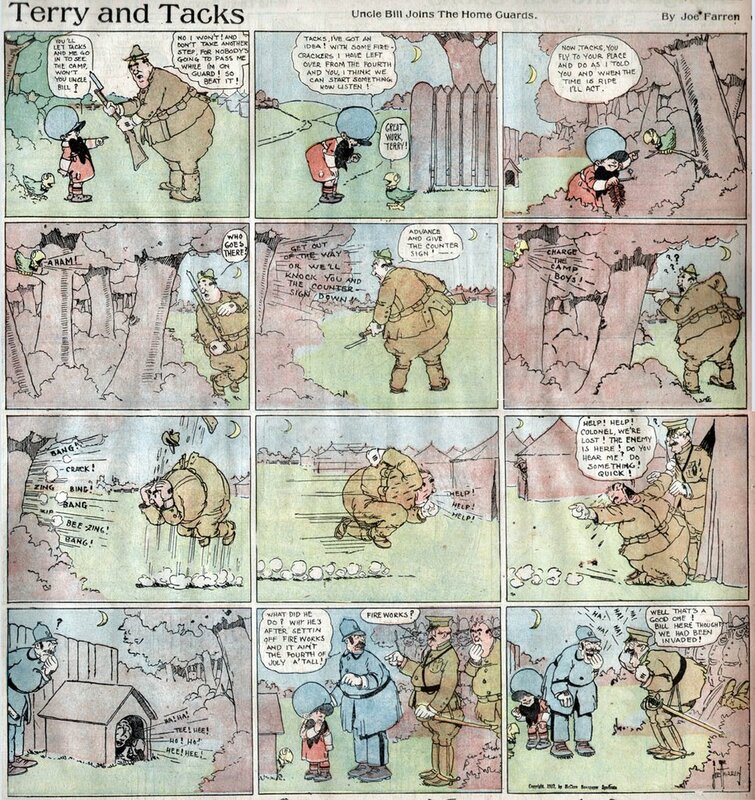 The strip was later reprinted in the World Color Printing preprint sections in 1925 and then again in 1930. A note to any servicemen and women reading this. Thank you for your service, and always remember that no matter what goes on politically regarding the sometimes ill-conceived military actions waged by the USA that the citizens of your country love, respect and admire each and every one of you for heeding the call to duty. I mentioned Dink Shannon the other day in connection with his work on the resurrected Constable Hayrick feature. Today we have a rare self-portrait of our man Dink at work in 1901. The feature is a one-shot display of single-panel gags and it ran in the World Color Printing Sunday section. As far as I know, Shannon did his only syndicated cartooning work for this poor-man's Sunday section, where he started in 1901 and was one of the foundations of their success until he disappeared in early 1909. Few comic strip fan have heard of any of Shannon's strips, but amongst the best and longest lasting were Mooney Miggles And The Magic Cap, Sammy Small and Mister Pest, Book Agent. If you look for Shannon's work, keep in mind that he often signed with just a four-leaf clover symbol. The sample above has double the fun, because in addition to the delightful Dink self-portrait, the gags are all related to crazy inventions. Don't let anyone spoof you with the claim that Rube Goldberg invented the concept! Goldberg certainly took the idea to a new level of lunacy, but lots of cartoonists were plowing the same ground well before the great man.